During the play, George Banks, played by Paul Reichert offers a kite to Michael Banks, played by CJ Ridley as Winifred Banks, played by Lisa Roth looks on the men. Mary Poppins will be presented at 7:30 p.m. Thursday, Friday and Saturday, July 9 to 11 and 2:30 p.m. on Sunday, July 12. The production will be presented at Archbold High School. 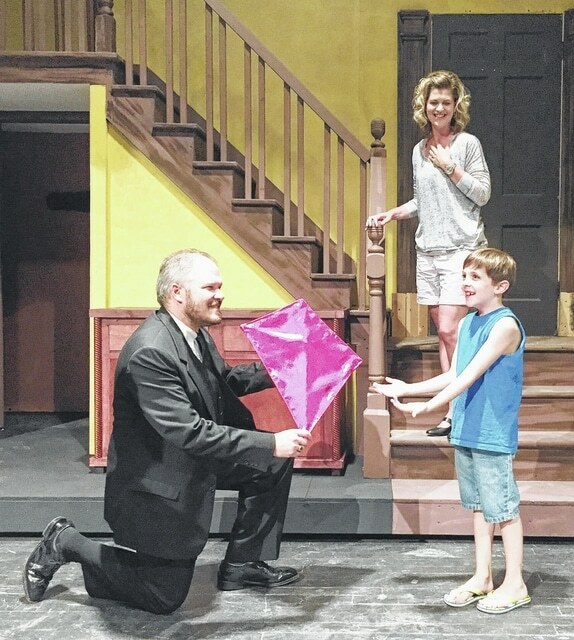 Floating into Archbold High School this July, the wildly popular musical, “Mary Poppins,” performed by Archbold Community Theatre, is ‘practically perfect.’ Based upon the books by P.L. Travers and the classic Walt Disney film of the same name, “Mary Poppins” is the whimsical story of the Banks family and how their lives are changed by the appearance of the titular nanny at their home in London. Precocious children Jane and Michael Banks are desperate for their parents’ love but find themselves at odds with their nannies, until no-nonsense Mary arrives to help them find their way. Populated with dancing chimney sweeps and penguins, singing bankers and friendly ladies feeding the birds, the show and its music are familiar to generations of children and adults alike. Directed by Michael Short, Archbold, with assistance from Teresa Van Sickle, Archbold, “Mary Poppins” boasts a two-story tall set of the Banks’ home, complete with a roof and five rooms. Audience members can expect to see scenes taking place in seven different ‘locations.’ Many of the songs audiences know and love, including ‘Supercalifragilisticexpialidocious,’ ‘Step In Time,’ ‘Jolly Holiday,’ ‘Spoonful of Sugar’ and ‘Feed the Bird,’ are in the stage production, in addition to some original ones that are sure to become new favorites. Playing the role of Mary Poppins, music teacher Bethany Riegsecker hails from Napoleon, and is joined on stage by Seth Nofzinger, Archbold as Mary’s multi-talented chimney sweep friend Bert, Isabel Roth, Whitehouse as bright Jane Banks, and CJ Ridley, Napoleon in his debut role as Michael Banks. The loving but misguided father of the children, George Banks, is portrayed by Paul Reichert, Archbold, with Lisa Roth of Whitehouse as his wife, Winifred Banks. The Banks family’s loyal staff are played by Perry Andre, Wauseon and Peggy Snyder, Napoleon, with Shawn Liechty, Pettisville admirably portraying the loose cannon of the neighborhood, Admiral Bloom. “Mary Poppins” will be performed on July 9, 10 and 11 at 7:30 p.m. and July 12 at 2:30 p.m. at Archbold High School.